Ambika Mata Mandir is a Hindu temple located in the village of Jagat, about 50 km southeast of Udaipur .Ambika Devi, a form of Goddess Durga is the presiding deity of the temple. the temple is preserved by the State Department of Archaeology and Museum, Rajasthan. Dadhimati mata temple of goddess Dadhimati is located in Nagaur district of Rajasthan, India, and is surrounded by villages goth-manglod. It is one of the oldest surviving temples in northern India.It is A Historical Palace of Rajasthan. It is One Shaktipith out of 52 shaktipiths. Galtaji is an ancient Hindu pilgrimage site situated 10 km from Jaipur in the Indian state of Rajasthan, on the Jaipur-Agra highway near Sisodia Rani Ka Bagh. The site features temples, pavilions, natural springs and holy 'kunds'. The main temple is the Temple of Galtaji, built in pink stone; it comprises a huge complex and is famous due to the large tribe of monkeys who live here. There are seven tanks here and the Galta Kund is considered the holiest. A large number of people take a holy bath in these tanks, especially on Makar Sankranti. It is believed that Saint Galav spent his life here and practiced meditation.There is another temple in the complex, the temple of Balaji. Yet another notable temple at Galta is Surya Temple; Surya is dedicated to the Sun God and was built in the 18th century.The place is known as Monkey temple (Galwar Bagh) in travel literature. Jagatpita Brahma Mandir is a Hindu temple situated at Pushkar in the Indian state of Rajasthan, close to the sacred Pushkar Lake to which its legend has an indelible link. The temple is one of very few existing temples dedicated to the Hindu creator-god Brahma in India and remains the most prominent among them.Although the present temple structure dates to the 14th century, the temple is believed to be 2000 years old. The temple is mainly built of marble and stone stabs. It has a distinct red pinnacle (shikhara) and a hamsa bird motif. The temple sanctum sanctorum holds the central images of Brahma and his second consort Gayatri.The temple is governed by the Sanyasi (ascetic) sect priesthood. On Kartik Poornima, a festival dedicated to Brahma is held when large number of pilgrims visit the temple, after bathing in the sacred lake. Kaila devi temple is a Hindu temple situated 23 km from Karauli district .The temple is located on the banks of the Kalisil river, a tributary of the Banas River in the hills of Trikut, 2 km to the north-west of Kaila village.The temple is dedicated to the tutelary deity, goddess Kaila Devi. It is a marble structure with a large courtyard of a checkered floor. In one place are a number of red flags planted by devotees.A fair known as Kaila devi fair is held here every year in the month of Chaitra, starting from Chaitra Budi 12 and lasting for a fortnight. 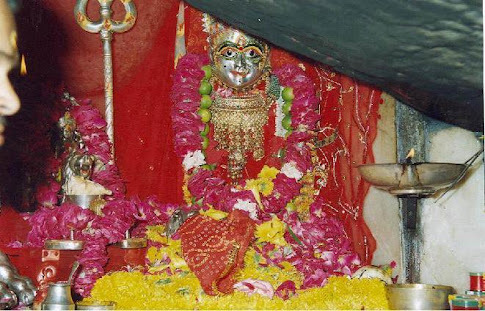 Kunjal Mata Temple of goddess Kunjal is located in Deh village of Jayal tehsil in Nagaur district of Rajasthan, India, and 1.3 km away from Deh's Bus Station on Nagaur-Ladnun National Highway-65.Temple area is 38 Bigha.It is A Historical Place of Rajasthan. Neemach Mata Temple is located on a hill on the banks of the Fateh Sagar Lake in the city of Udaipur, Rajasthan. It has both stairs and uphill slope walk way to climb, which is around 900 Meters long. It enshrines the stone idol of Neemach Mata Devi. There is also an idol of Lord Ganesh and three west facing lions of stone. One can have very beautiful view of whole city and it's lakes from the temple as well as while climbing. Nandni Mata Temple is very famous in the Banswara district of Rajasthan. It is 15 km from Banswara, situated on the state highway near Barodiya town. The main temple is located on top of the hills near Barodiya village in Vagad. Many myths and rituals centre on the black stone statue here some centuries ago which was later destroyed by demolishers, and is now replaced by the new beautiful idol. Parshuram Mahadev Temple is a Shiva temple in Pali district of Rajasthan. this place located in the serene surroundings in the foothills of Aravalis mountain range . The cave situated at a height of 4000 feet above sea-level has naturally made figures of Lord Ganesh and Lord Shiva and also has nine Kunds which never go dry. Fairs are also organised here twice a year. The place is 14 km from Sadri town.On the Shravan Shukla Sastami and Saptami( 6th and 7th ) usually falling in August -September a large fair is organised temple. The Sanwaliaji temple of the Dark Krishna is situated on the Chittorgarh - Udaipur Highway, at the town of Mandaphia, about 40 kilometers from Chittorgarh. This temple of Shri Krishna is considered second only to the temple of the Lord Shrinathji at Nathdwara.There is a lot of recent construction activity of the temple proper. The temple trust has built and maintained several Guest houses for the use of the devotees. Salasar Balaji is a religious place for the devotees of Lord Hanuman. It is situated in Churu district of Rajasthan. Salasar Dham attracts innumerable Indian worshipers throughout the year. On Chaitra Purnima and Ashvin Purnima large fairs are organized every year where more than 6 to 7 lakhs of people assemble here to pay their homage to the deity. Hanuman Sewa Samiti looks after the management of the Temple and the fairs. There are many Dharamshalas to stay and restaurants to eat. The temple of Sri Hanuman is situated right in the middle of the Salasar town. The festival of Sri Hanuman Jayanti is celebrated on Chaitra Shukla Chaturdashi and Purnima every year. Sundha Mata temple is about 900 years old temple of Mother goddess situated on a hilltop called 'Sundha', located at Jalore District of Rajasthan. It is 64 km from Mount Abu and 20 km from the town of Bhinmal During Navratri tourists from Gujarat and nearby areas come in a large number. Regular buses Gujarat roadways from Palanpur, Deesa and elsewhere run during that time. Shri Sonana Khetlaji is a temple of Shri Khetlaji located in the village Sonana of Pali district in Rajasthan.Shri Sonana Khetlaji template located at Sarangvas was found before 800 years ago.Every year on Chaitra Shukal Badi Teras (according to Vikram Samvat), a big fair is organised for two days.Since this fair is organised after Holi festival a large number of Holi dancers attend this fair in his conventional and fancy dresses. More than one lacs devotee participates in this fair. •Vimal Vasahi (Shri Adi Nathji temple) dedicated to the first Jain Tirthankar lord Rishabh. •Luna Vasahi (Shri Neminathji temple) dedicated to the 22nd Jain Tirthankar lord Neminatha. •Pithalhar (Shri Rishabha Devji temple) dedicated to the first Jain Tirthankar lord Rishabh. •Khartar Vasahi (Shri Parshva Nathji temple) dedicated to the 23rd Jain Tirthankar lord Parshva. •Mahavir Swami (Shri Mahavir Swamiji temple) dedicated to the last Jain Tirthankar lord Mahavir. Jirawala is a village in Sirohi District of Rajasthan state in India. It lies 58 km from Abu Road. It is a holy place for Jains. There is a famous Jain temple complex in the village. The main Parsvanatha temple thein is the oldest dating back to 1134 AD. There is a temple with image of Neminatha. Muchhal Mahavir temple is a Jain temple dedicated to Lord Mahavir, at Ghanerao, in Pali district in Rajasthan .The place is on the route from Falna to Kumbhalgarh.The fair is held here every year on the thirteenth day of the month of Chaitra. Padampura is the site of Padampura Digamber Jain Atishay kshetra in Shivdaspura town in Jaipur district of Rajasthan, India. It is located at a distance of 35 km from Jaipur on Jaipur-Kota road.It was on baishak shukla panchami samvat 2001 (1944 AD) one simple boy named Moola Jat was digging foundation for constructing his house when he struck with a stone statue. Experts later identified it as that of Digambar Jain Tirthankar Padmaprabha. This area has been developed as Padampura Digambar Jain Atishay kshetra. Ranakpur is a village located in Desuri tehsil near Sadri town in the Pali district of Rajasthan in western India. It is located between Jodhpur and Udaipur, in a valley on the western side of the Aravalli Range. Ranakpur is easily accessed by road from Udaipur. Ranakpur is widely known for its marble Jain temple, and for a much older Sun Temple which lies opposite the former. Rikhabdeo is a census town in Udaipur district in the Indian state of Rajasthan.Rishabhadeoji is situated 65 km from Udaipur and is on Udaipur-Ahmedabad Road. It is a well known pilgrim site. The main attraction is the temple of Rishabhadeoji , the first Jain tirthankara. Shri Mahavirji temple is in Karauli district in Rajasthan, India and is 110 km from Sawai Madhopur town. Earlier known as Chandanpur, this small village became famous as a Jain religious site after an ancient idol of Mahavira was excavated from its soil several hundred years ago. It was then renamed as Shri Mahavirji. This idol was excavated over 200 years ago from the same spot, after which the temple was constructed. It has a 78 cm high copper-colored idol of Mahavir in the Padmasana posture. About 175 km away from Jaipur it lies on the banks of Gambhiri river. The main attraction of the temple is an imposing 32 ft high image of Lord Shantinath, the 16th Jain tirthankar. Padampuri Tour Packages Comment Thanks for sharing good information !